The Treaty of Waitangi was the climax of a long series of events which finally led the then British Government to establish the sovereignty of the Crown over the islands of New Zealand. When Captain William Hobson arrived at the Bay of Islands as Lieutenant Governor, the northern chiefs were summoned to Waitangi for the purpose of negotiating a treaty. After much explanation and discussion, forty-five chiefs signed the Treaty by drawing their moko, the tattooed design on each face, upon the parchment on 6 February 1840. In 1932, Governor-General Lord Bledisloe and his wife purchased and presented to the nation the run-down house of James Busby, where the treaty was signed. The Treaty house and grounds were made a public reserve, which was dedicated on 6 February 1934. This event is considered by some to be the first Waitangi Day, although celebrations were not yet held annually. It would not be until the 1940s that any real attempt was made to celebrate it, but even then, it was not considered a holiday. 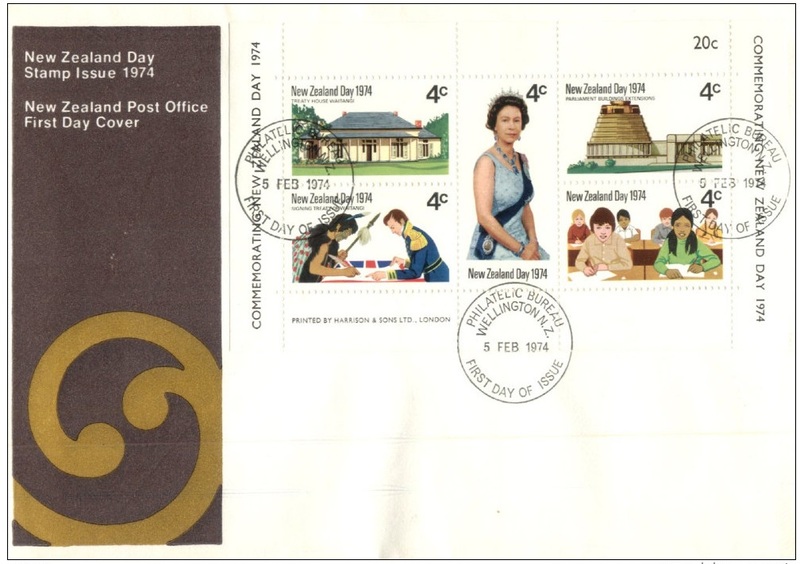 In 1971 the Labour shadow minister of Māori Affairs, Matiu Rata, introduced a private member's bill to make Waitangi Day a national holiday, to be called New Zealand Day. This was unsuccessful and did not pass into law. After the 1972 election of the third Labour government under Norman Kirk, it was announced that from 1974 Waitangi Day would become a national holiday, known as New Zealand Day. The New Zealand Day Act 1973 was passed in 1973. For Norman Kirk, the change was simply an acceptance that New Zealand was ready to move forward towards a broader concept of nationhood. Diplomatic posts had for some years marked this day, and so it seemed timely in view of the country's increasing role on the international stage that the national day becomes known as New Zealand Day. At the 1974 celebrations, the Flag of New Zealand was flown for the first time at the top of the flagstaff at Waitangi, rather than the Union Flag, and a replica of the flag of the United Tribes of New Zealand was also flown. 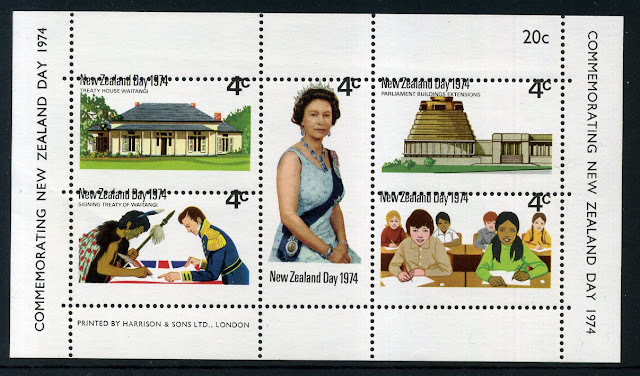 The election of the third National government in 1975 led to New Zealand Day being renamed Waitangi Day, because, the new Prime Minister, Rob Muldoon, did not like the name "New Zealand Day" and many Māori felt the new name debased the importance of the Treaty of Waitangi. Another Waitangi Day Act was passed in 1976 to change the name of the day back to Waitangi Day. 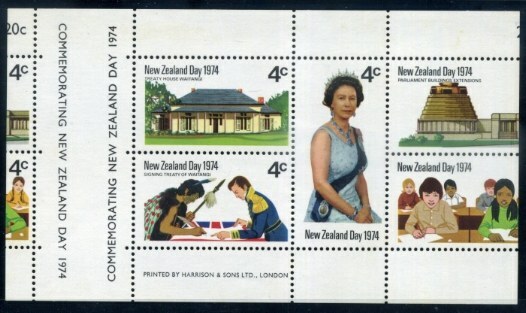 Miniature Sheet Commemorating New Zealand Day. 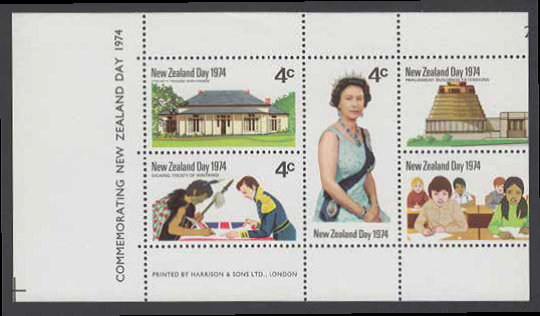 To commemorate the first New Zealand Day, a special issue of postage stamps was produced. The stamps were issued in sheets of 100 (as seen below) or as a miniature sheet of five 4c stamps (as seen above). In some cases, this sheet was separated for postage but more often it was held by collectors as a full sheet. Below, because we were unable to find quality images of each stamp, we have electronically separated the five stamps from the miniature sheet above and included details about each design. 4c - Signing the Treaty of Waitangi. This stamp depicts Captain William Hobson, R.N. and a Maori Chief signing the Treaty of Waitangi. Hobson was the author of the Treaty acting on behalf of the British Government. He was New Zealand's first Governor and so the head of its first fully authoritative government. 4c - Treaty House at Waitangi. This early building was the residence of the "British Resident" James Busby in 1840 when the Treaty was signed. In 1932, Governor-General Lord Bledisloe and his wife purchased and presented to the people of New Zealand. It became a public reserve and the focus of the main Waitangi Celebrations. The current Queen, who attended the 1974 Waitangi celebrations with her husband H.R.H. Prince Phillip. See our post - Queen Elizabeth - A Younge Queen. New extensions to Parliament Buildings and the Beehive. 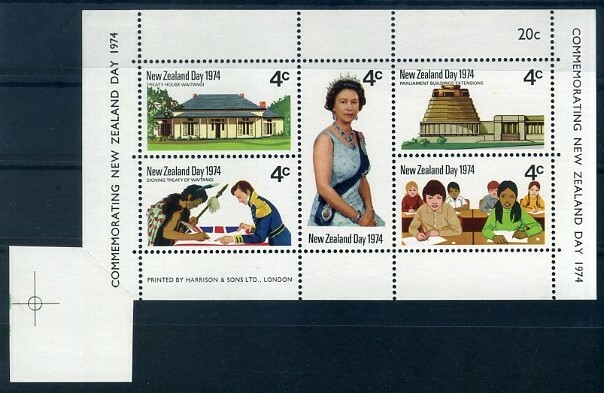 This stamp features an illustration of the new Parliament Building extensions, known as the "beehive" due to its distinctive shape, still under construction in 1974 when this stamp was issued. Built in stages from 1969 - 1979, the building was open by Her Majesty Queen Elizabeth II in 1977, with the Government finally moving into the top floors in 1979. See our post - Parliament Buildings. Maori and Pakeha Children Studying Together. The final stamp was intended to show the total integrated nature of New Zealand's education system, within which no distinctions are made on account of race, colour or creed. This is demonstrated by the Maori girl and Pakaha boy sitting beside each other in class. 1974 New Zealand Day miniature sheets were printed in large sheets then guillotined into individual sheets. during the guillotining process, some errors occurred. In these two examples, the sheets were guillotined too far to the left leaving the design off-centred and running off the right-hand side. The difference between these two examples is partly caused by their positions in the full sheet, the top one coming from a left-hand edge and the lower one from an internal location. Notice the internal gutter intended to be placed between two miniature sheets. Here is a perforation shift towards the bottom. 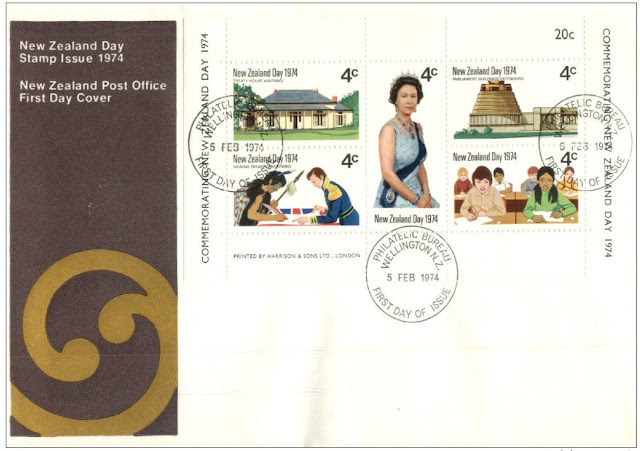 Miniature Sheet First Day Cover - 5 February 1974. With British sailing ship and Maori canoes. This Maori Waka (war canoe) 'Nga Toki Matawhadrua' was restored and re-launched for the 1974 celebrations. 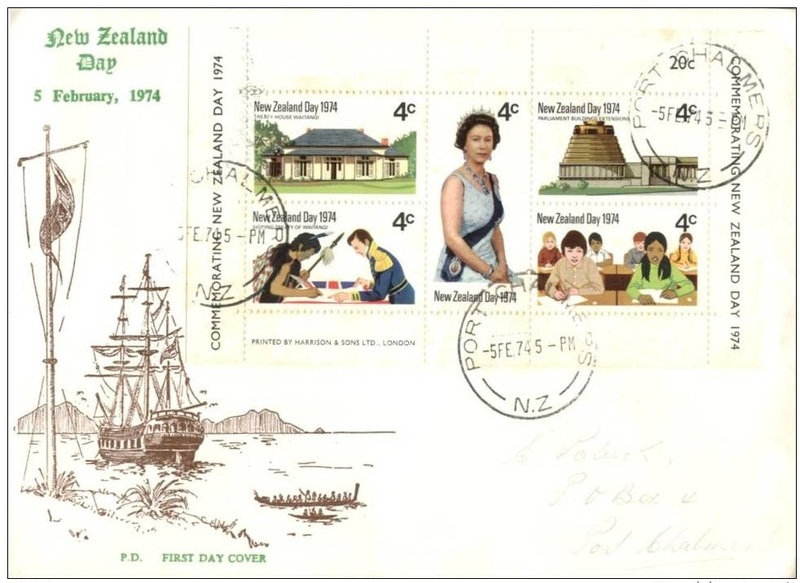 A bag containing mail, including this special cover, was carried on New Zealand Day, 6th Feb 1975. If you look closely you can see it was cancelled in Paihia on the 5th Feb 1974. See Kupe and the First Maori Settlers. Date of Issue: 5 February 1974. Designers: D A Hatcher, Auckland and A G Mitchell, Wellington. Printers: Harrison and Sons, England. Stamp Size: 24.13mm x 48.26mm. Sheet Size: 100 stamps per sheet. Paper Type: Harrison and Sons, chalk surfaced, unwatermarked. I have just discovered this post on your blog. 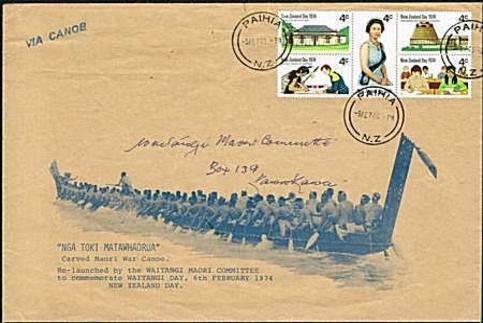 The special cover viewing the waka "Nga Toki Matawhadrua" is a special find. Where did you get this cover? I would like one with my own collection. I am a thematic collector of stamps relating to Maori. You do I good job of presenting our culture, not making judgement, just telling the way it is. I follow you closely but have never ventured to comment before. I know you like people to give a name. I am unsure how to reply here as I didn't write that last part about the waka cover. I have handed your comment to Allan as he writes all our Maori posts. 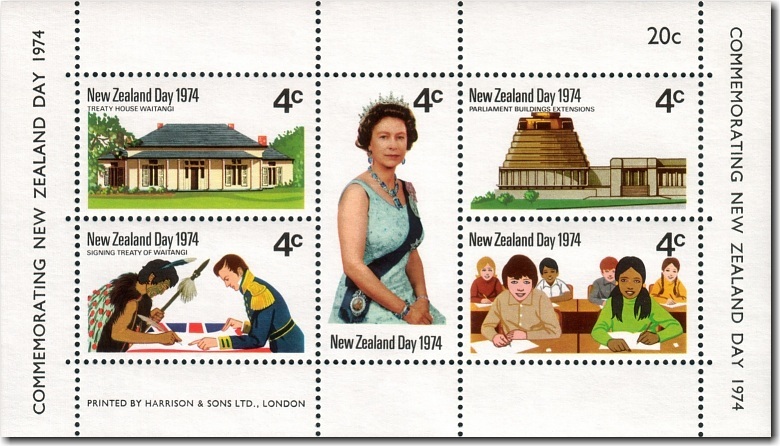 We have a page on New Zealand Parliament stamps in our thematic collections. Auckland City Stamps is one of the larger stamp dealers that you can visit. You can search for them via their web site www.aucklandcitystamps.co.nz or visit them at 1 Ngaire Ave, New Market. Or you could contact a dealer we use found via the address under the post above known as NZ Stamps. Note we are not stamp dealers so any advice we give is just our personal opinion.